The Floyd Rose (also known as a “double-locking” tremolo system) is one of the most recognisable and praised inventions ever created in the guitar industry. When introduced in the early 80s, the Floyd Rose system took the guitar world by storm, and was seen fitted to the instruments of some of rock’s biggest names. Decades later, the system remains a popular hardware choice for guitar manufacturers, still relevant in the 21st Century. If you haven’t heard of the Floyd Rose and want to find out more about its history and how to restring this technical tremolo, we provide everything you need to know in this informative guide! What is a Floyd Rose? 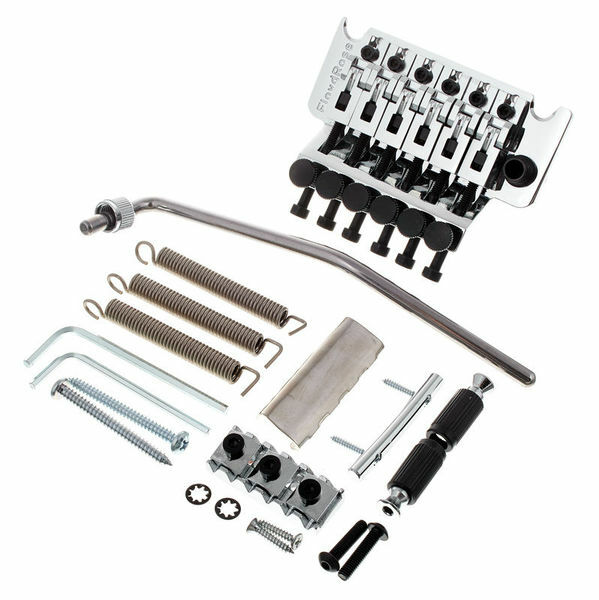 A Floyd Rose is a double-locking tremolo system designed for electric guitars. Invented by (you guessed it!) Floyd D. Rose in the late 70s, this bridge revolutionised the guitar industry throughout the 80s and beyond. Legendary players such Eddie Van Halen and Steve Vai pioneered the design with their distinctive whammy bar acrobatics, bringing it into the mainstream spotlight. Over thirty years later, Rose’s invention is as popular as ever – featured on hundreds of production guitars today. How Does a Floyd Rose Work? A Floyd Rose lets you lock the strings in place at two points on your guitar – at the bridge itself, and at the nut. The bridge features locking saddles, which the strings are inserted into. These are then fixed into place via tightening bolts on the back of the bridge, which are adjustable with an allen wrench. 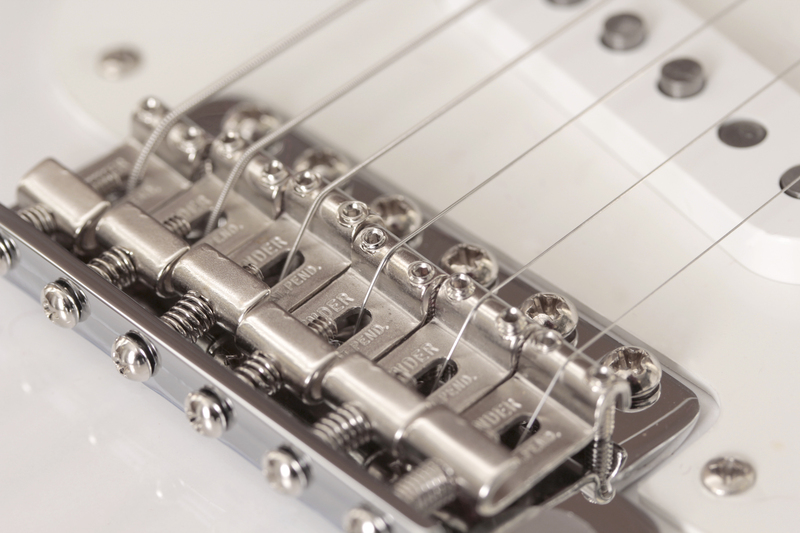 The bridge also features “fine tuners”, one for each string. This lets players tune their guitar if strings sharpen or flatten from extensive use or temperature changes. The locking nut, which is used in place of a traditional bone or synthetic nut, has a similar locking design. Using 3 metal plates, these lock down 2 strings each and are also tightened with an allen wrench. This prevents the strings from sliding over the nut and going out of tune when using the whammy bar. How did the Floyd Rose system come to fruition? Floyd’s light bulb moment occurred when he was rehearsing with his band. His playing was heavily influenced by Jimi Hendrix and Ritchie Blackmore (Deep Purple), two guitar icons who famously used the tremolos on their Stratocasters. Frustrated with constantly knocking his instrument out of tune when using the traditional Fender-style vibrato on his ’57 Strat, Rose decided to develop his own tremolo system that could keep a guitar in tune. Using his metal and crafting skills from making jewellery, Rose developed early prototypes. This included a system that locked the strings at the bridge and nut, but lacked fine tuners. The problem with this primitive design was that you would have to tune your guitar perfectly before locking the strings down. If a string sharpened or flattened, you would have to unlock it at the nut and retune again. Funnily enough, a similar design to this early version exists on Guthrie Govan’s signature Charvel guitars (without the locking nut). According to him, he prefers the lower maintenance of this system, and believes it offers him stable enough tuning. After experimenting with different metals, including brass (which wore down too quickly), Rose settled on hardened steel to form the two main components of the system. His iconic version, which has remained largely unchanged, features the legendary double-locking design. This has the addition of fine tuners at the bridge, to allow players to tune after locking the strings in place. After first appearing on Kramer guitars in the 80s, demand grew following the hair metal craze that dominated the decade. In this period, playing a guitar without the system was somewhat abnormal! To cope with the popularity, Rose licensed his design to companies such as Schaller, who mass-produced his ‘Original Floyd Rose’ system. Today, this is still considered the best version, in terms of tuning stability and reliability. The Original Floyd is usually seen fitted to high-end guitars, although many affordable instruments feature licensed copies made from cheaper materials. Some of these, such as the 1000 Series Floyd Rose, still offer great performance despite their lower cost. Are There Any Other Double-Locking Tremolos? Indeed there are! The other most well-known manufacturer of double-locking tremolos is Ibanez, who produce the renowned ‘Edge’ series systems. More or less the same in terms of design, Ibanez have many different iterations of the Edge tremolo. They have also produced ergonomic low-profile versions, where the fine tuners sit lower down and are less in the way of the picking hand. The quality of these tremolos is usually excellent, with many Ibanez players complementing their stability and smooth feel. Kahler also produce double-locking tremolo bridges. However, they followed a slightly different design philosophy, and the physical differences between their systems and Floyds is quite noticeable. Kahler were a main competitor to Floyd Rose in the 80s, and a bitter lawsuit between the two companies ensued from Kahler supposedly copying Rose’s idea. Nevertheless, their systems have also been popular with some guitarists, including Jerry Cantrell (Alice In Chains) and Kerry King (Slayer). These companies have also catered for extended range players, manufacturing 7 and 8 string versions of their tremolo systems. 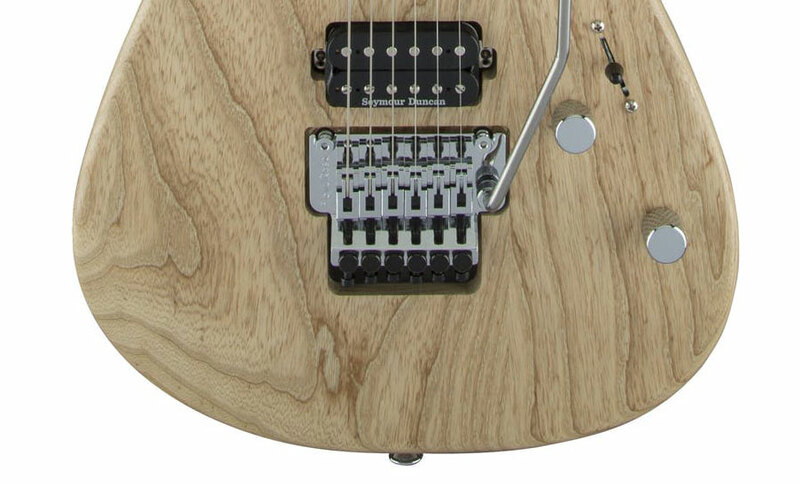 Following the same design essentially, these bridges have extra saddles and slots in the locking nut to accommodate the higher number of strings. Guitars that featured Floyds in the early days mostly had ‘non-routed’ cavities. This meant that the bar could only be used to lower the pitch. Some players had experimented with the idea, but it was Steve Vai who popularised the ‘routed’ design, with his iconic Ibanez JEM guitar. This is where a chunk of wood behind the bridge is carved out, allowing you to pull up on the bar so that you can raise the pitch and achieve ‘flutter’ effects. Others followed suit; most notably Dimebag Darrell of Pantera, who used the Floyd Rose to develop his signature sound. Darrell popularised using pinched harmonics in conjunction with the whammy bar, to achieve dramatic-sounding “squealies”. Joe Satriani was one of the first players to employ this extreme technique however, which can be heard prominently in his renowned instrumental “Surfing With The Alien”. How Do I Restring a Floyd Rose? In the next part of this article, we are going to look at how to restring a Floyd Rose. Luckily for most Ibanez owners, this next part is relevant to your tremolos too! Double-locking tremolo systems have their many advantages, however this isn’t exactly one of them. The process becomes easier after a few times, however restringing a Floyd is more technical than restringing a traditional tune-o-matic or fixed bridge. There are different ways of doing this, but we’ve detailed our preferred method below. Start things off by grabbing a couple of allen wrenches. Most Floyd Rose-equipped guitars would have included these when you made your purchase, with the right sizes provided for your tremolo. If not, you can easily purchase a set of allen wrenches at your local DIY shop. They are necessary to loosen certain components, allowing you to release the old strings. Make sure you also have a string winder handy, as this will speed up the process significantly. Wire cutters will be needed to cut off the string(s) excess, including the ball ends of each replacement string. 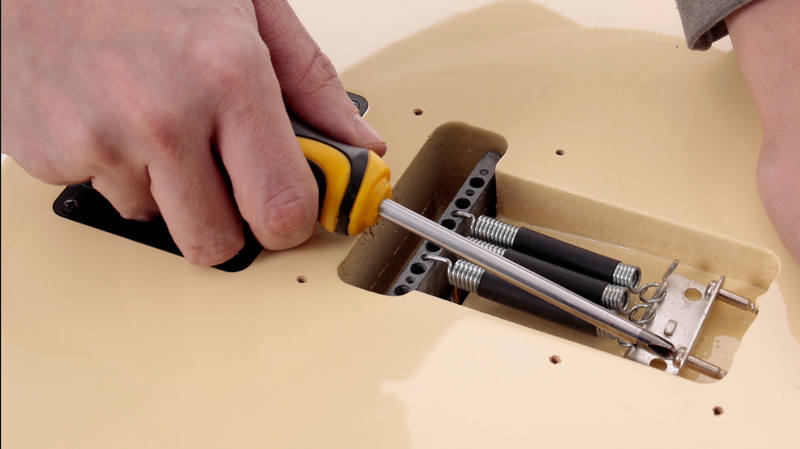 You may also need a Phillips-style screwdriver to remove the back-plate from your guitar, so that you can make adjustments to the tremolo springs and their tension. This may not be necessary, unless you’re changing to heavier/lighter gauge strings. If you’re missing any of the tools specified above, make sure to check out our Tools & Maintenance range. Start off by removing the locking nut plates. Make sure you put them somewhere safe in the meantime, as they’re easy to lose! This will take pressure off the strings, meaning that they are free to unwind and remove. This is important: remove and replace one string at a time. Why? Doing this will ensure that the bridge retains the same tension after you’ve finished restringing (provided the string gauges are the same). Use your string winder (or fingers if you don’t have one) to start unwinding the low E string at the tuning peg until it’s lost tension. Carefully pull the string out of the peg and don’t stab your fingers with the end of the old string, it hurts! Next, use an allen wrench to loosen the corresponding saddle at the bridge end. Make sure to also do this carefully, as there is a small metal block that keeps the string tightened – which may fall out. You do not want to lose one of these either! If you have a floating (or routed) tremolo system, you may notice that the bridge will have dipped back. This is fine, as tension from the removed string is lost and therefore the springs are working more effectively without it. Now, you should be able to pull the string out entirely. Wind up the string into a neat coil, and dispose of safely. This should be fairly easy. Basically, do almost the complete opposite of the previous step! Take out the replacement string from the new pack. Unwrap the string, and use a pair of wire cutters to snip off the ball end, including the section where it is tightly twisted. You can now insert the string into the saddle at the bridge, and tighten it using the correct-sized allen wrench. Do not over-tighten! Now that the new string is secured at the bridge, you can insert the other end of the string into the tuning post hole, ensuring that it’s placed correctly over the nut slot. Make sure that there is some slack, so that the string will wrap nicely around the post a couple of times. Wind the string up to the pitch it needs to be, so that the tension is kept balanced like before. If you’re using the same string gauges as your previous set, the bridge should sit parallel to the surface of the guitar body. This is easier to notice with a floating bridge system, however if you have a non-routed guitar, you can check by gently pressing down on the bar and feeling whether the response is the same as before. If you are changing to a thicker set of strings or a lighter gauge, things will look different. A heavier string set will generate more tension, therefore causing more strain on the springs that counter-balance the Floyd Rose. If you don’t make any adjustments, then the bridge will appear to lean forward towards the guitar. This is something you absolutely want to avoid, as the action (string height from the fretboard) and intonation (the tuning balance across the fretboard) will be badly affected. This could make your instrument almost unplayable – so listen up! If you’re changing string gauge, then you will need to open up the back of your guitar to get to the springs. Grab your screwdriver, and tighten the claw that holds the springs to the inside of the guitar body. Make a quarter-turn at a time – check – and turn until the bridge is level again. Once you’ve changed the first string, repeat the same steps for the rest of them. You might find the process will become more fiddly with the 3 higher strings, however the same method will work. Although slightly more patience may be required! Once you’ve changed every string, tune up to pitch and double-check that the bridge is balanced. Like with any string change, “break” (not literally) the new strings in by playing them for a while and gently stretching them. The strings are at their most tense when they’re new, so once they’ve been played in, tune up and fit the locking nut plates back on and tighten them. Job done! The most important thing now is to not go anywhere near the headstock tuners! If you try and tune from there then nothing will happen, and you’ll probably end up snapping your string. This is why fine tuners are on the bridge, so that you can adjust the tuning without unlocking anything at either side. What a great invention, right? This video details a different method to ours, whereby all the strings are removed first and a block is placed under the rear of the tremolo to maintain tension and balance. You get the same result after all, and some of you may end up liking this method more! Are you curious about how long it can take to restring a Floyd Rose-style bridge? Check out our ‘How Long Does It Take To Restring a Bigsby & Floyd Rose?‘article, comparing two of the trickiest tremolos! Thanks, Elliot. I have a question, please? My US made Charvel San Dimas (approx 2009) looks to have a compound radius fingerboard – 12″ to 16″ at a guess. The action on the G and D strings above the 12th fret is notably higher than on the E strings, with the A and B strings being somewhere in between, which implies to me that the radius of the Floyd’s saddles is set tighter than that of the fingerboard – 10″ to 12″ at a guess. Is this likely to be the case, and if so, what can be done to reduce the action on the G and D strings and flatten the radius of the Floyd? Thanks. Hi John, thanks for your question and apologies for the late response! Adjusting the individual saddles on your Floyd Rose isn’t as simple as a traditional tremolo or tune-o-matic bridge. Floyd Rose advise adding a shim beneath the saddles to raise them, so it may be best to do that for the “outside” string saddles so that they sit flatter with the middle ones. After that you can then lower the overall height of the Floyd Rose unit. If you’re unsure, it would be best to see your local guitar tech for further advice. Thanks, Elliott. I would be comfortable to have a go at adding the shims. Do you stock them, or can you obtain them? The new Lockmeister (Schaller) uses C45 steel for the base plate. What do they use in the Original Floyd Rose base plates?